I loved this venue from the moment I saw it. Beautifully renovated and they're adding things all the time. We had a beautiful wedding. Lori and her husband were fantastic and so helpful! Lori guided me through every step of the process because I honestly knew nothing. I'm so glad we found The Homestead! Our wedding was awesome! Everything went so smooth, and as the bride I felt like I didn't have to worry about anything. Lori and Dave were on top of everything, they were very professional, worked with us on scheduling and we're very friendly and easy to work with. I feel like they have been doing this for years. I highly recommend this venue, it's not only beautiful but original. I wish the day never ended. Thank you Lori & Dave we appreciate everything you guys did! Flawless execution! I have to say the Homestead is one of the most beautiful places for a wedding or most any type of celebration. I enjoyed 8/8/15 - fantastic food service, bar, the help you give to all young and old was amazing. Thank you for all the many extra ways you show kindness. This is one very happy grandma at Lena and Andrew's wedding. We were so happy we found The Homestead 1835, and really happy we found Lori and David! We had a mix up with our original venue and found ourselves venueless in February for a May 10th wedding. My husband got on the internet and looked in the region and found The Homestead 1835. Lucky for us, since we had an early season wedding, The Homestead happened to be available for our wedding. Right from the beginning, Lori and David were so accommodating. Any request they had, they looked into and never stopped until the job was done. They were so on top of everything that we never had to ask the status on any given project, we were kept up to date throughout. I'm not doing a great job of describing them, but they are the people you want on your side when it comes to your wedding day. I didn't have to question anything and felt comfortable letting the day unfold. I am normally a micromanager, but with them I didn't need to double check and triple check anything. I just got to be the bride instead of the director. Overall, we were so thrilled with their work ethic and ultimately the work. The wedding went off as planned and we were thrilled to be there. A few of our friends and family thought they wanted to have their weddings there! People could not stop talking about how it was such a beautiful location. We could not have asked for any more! I truly only have positive things to say about this venue and the owners! My wedding day was perfect from beginning to end. All of the guests left raving about the awesome venue. My husband and I wanted a laid-back atmosphere where we could have a "family reunion" type of feel. We got exactly that. We had many outdoor games, a campfire, and the barn opened up for an easy flow to the bar and dance floor. Lori and Dave, the owners, were patient, listened to all of our requests, responded to questions timely, were flexible, and encouraged us all along the way. While they are fairly new to the wedding venue world, they are diving in head first and doing a wonderful job! Every time I would talk to Lori or visit in preparation, it seemed like there was a new opportunity or service available. This venue is going places! I cannot think of a better place to have my wedding and, due to their flexibility, I was able to do everything on an awesome budget! As long as you are responsible, follow their very basic venue guidelines and respect their beautiful property, you will get the same in return. If you are looking to have a wedding day where you can relax, kick back, and enjoy a beautiful view... this is the place for you! I have nothing but awesome things to say about this venue and the owners of it. We booked almost a year in advance and the owners were extremely helpful in recommending vendors. When it came to my week of, the venue was not booked the night before, so we were allowed in 2 hours prior to our rehearsal to decorate. The owners were gracious in helping us with arranging seats and where to place activities for the day of. They even helped organize my wedding party for the ceremony. The sound system and the decor in the barn is amazing. The bar was made from the old wood when they were remodeling. 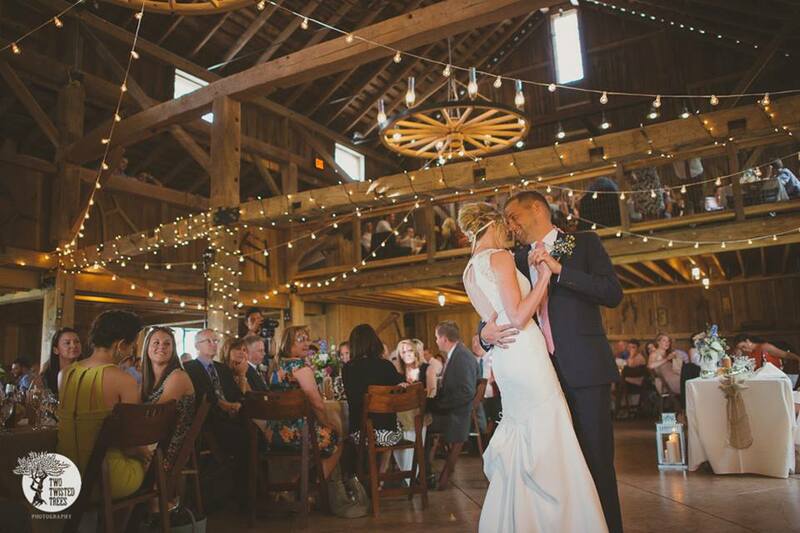 The one thing you have to remember brides, is that this venue (the barn) is not air-conditioned. But it is a well shaded barn. It was so humid, but once we opened the barn for dinner and dancing the breeze that came thru the windows and doors was cooling and refreshing. And they have fans! The bathrooms are tiled and well insulated that it was even cool in there. In the corn crib we set up the photo booth. Outside the corn crib, we had the fire pit, and corn hole. The bridal/groomsmen suite is air-conditioned, and that was great right before the ceremony. I was extremely hot in my dress and overheated from taking photos before the ceremony. It was nice to cool down and refresh before saying I Do. Overall, the history of this barn is still here and it made the experience all the more memorable! I grew up on a farm and always knew I would get married on one. I have nothing but love for the owners and this venue. I couldn't of asked for a more perfect day. Thank you so very much for creating a venue that allowed us the most magical day of our lives. Honestly, I get teary eyed every single time I think about our wedding day and how perfect it was. I also think about the journey we went on with you guys from the first time we saw the venue 1.5 years ago to the day we got married there! You are amazing, caring people who gave us a level of service and most importantly, peace of mind throughout the planning process. I honestly knew that no matter what the weather and no matter what hiccups happened throughout the day, that you would be there to ensure everything was running smoothly. And it did! I look back on that day and literally have only an abundance of happy, positive memories that Matt and I will take with us for the rest of our lives. This venue made my wedding a dream come true! I had always pictured having a country style wedding with my cowboy boots and all and I can not express how thankful I am to Lori and Dave for making our day one that I will cherish for a lifetime! Thank you so much for being there for me through it all! I was planning my wedding from New York State and from the first time I came to the Homestead to the time when the wedding reception died down, Lori was there for me through it all. 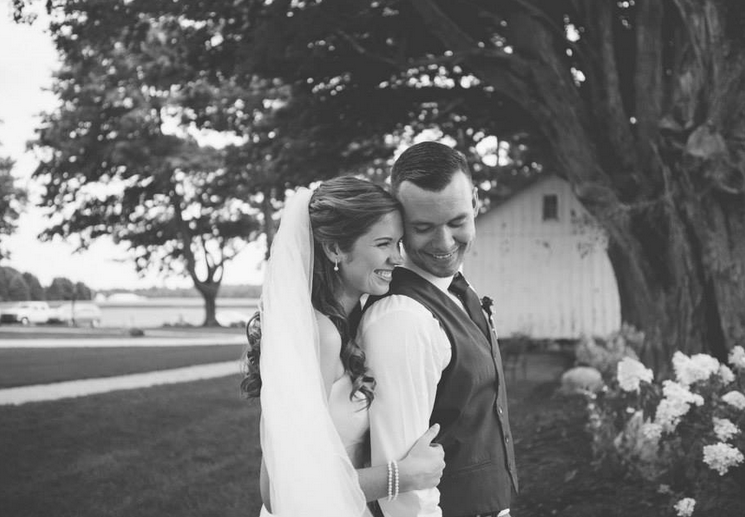 She made the planning process so easy with her vendor list. This is where I found ALL of my wedding vendors & I wouldn't have it any other way. The best part was, they had already worked with Lori and her team before which made everything a piece of cake on the day of! Lori and Dave helped us set up the day before, gave great advice and made sure our day was stress free. Lori & Dave, Thank you so much for your amazing support! I wish you the best with your future weddings. Mine was everything I dreamed of...Thank you for bringing it to life! We would like to thank you from the bottom of our hearts for helping us make our day the most special day ever! 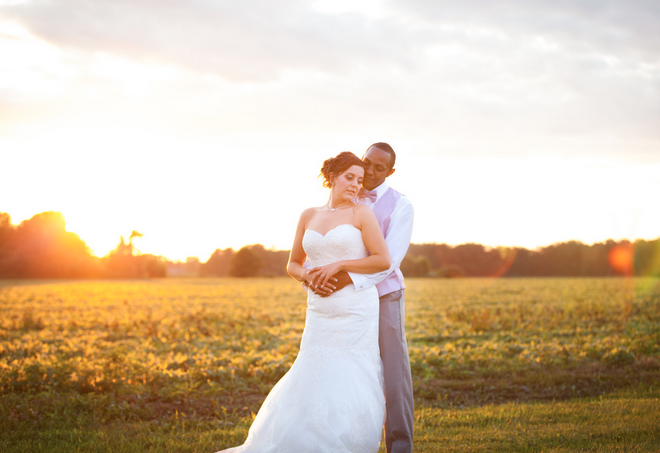 We are so glad that we chose you and your husband, your staff, and your gorgeous facility for our wedding. When we recently received all our pictures from Josephiney Photography, all of the emotions came rushing back. We were put right back there on that day and couldn't be happier with our decision! Every time we talk about the wedding to anyone we cannot find one thing about that day that we were unhappy about! Thank you again SO much for everything! 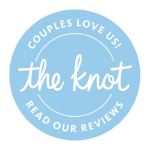 We want to express our sincere gratitude for all of your hard work and guidance to make our wedding day one of a kind. Thank you Lori and staff for making our dream wedding come true! Thank you so much for providing the perfect place for us to celebrate our wedding! You've been so wonderful to work with and get to talk to! My wedding was a little over 2 months ago, and I still think about how beautiful it was. The Homestead was such a perfect place for what i had in mind. When I walked into the barn for the first time to see all my thoughts and ideas for how I wanted it, it was simply breathtaking. It was perfect. the ceremony space was absolutely beautiful and the new walk way just adds to it. I didnt decorate much because i honestly thought it didnt need it. The corn crib had our trail mix bar, smores and photobooth and was perfect! The fire pit offered some moments for our guests to make smores and visit with each other. And lori and her husband were perfect hosts and made sure everything ran smoothly! I keep getting compliments on how beaut it was and how perfect our venue was. I would honestly recommend this to anyone who is looking for a country/rustic venue!